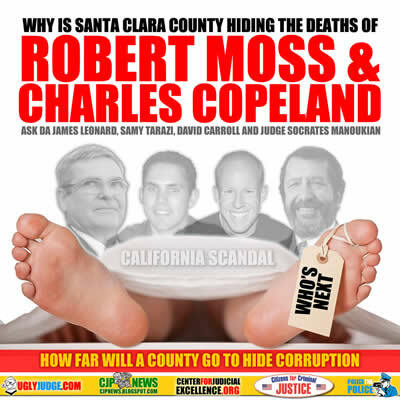 Why is Santa Clara County Hiding the deaths of Robert Moss and Charles Copeland? Good question and which opens up a huge can of worms for a California county which has had it’s share of scandals and corruption. We’ve come into information from numerous sources which points to judges, police and government using their authority to hide crime, corruption and even murder. In Memory of a VETERAN who has FALLEN DEFENDING HIS RIGHTS, IN THE COUNTRY HE SERVED. My father CHARLES S. COPELAND was a Navy Vet, retired from NASA. I witnessed the public guardian Shawn Parr laughing and stating “it’s like stealing candy from a baby!” outside the courthouse when they conserved my Dad, after falsely stating he was not a vet!!! They transferred 10 million in assets to Hai P Tran, the VP of Fidelity, the Trustee for Santa Clara. Mortgage Companies were used to immediately remove all equity, and my father died fighting to recover his estate which was distributed through Tran to associates of the County’s family trusts. My father was left dead in Tran’s house for 3 weeks, and the DA refused to investigate! He failed to appear, after asking for expert opinion of evidence presented by Tran’s attorney, Ann Nguyen of Robinson and Wood. I filed complaints against Judge Grilli who granted final assets to Tran’s relative (which were not conserved) with the Commission on Judicial Performance, and the President Erica Yew recused herself because she was a Partner of Robinson and Wood, and sits on the bench with Grilli, approving final distributions of conserved assets. Robinson and Wood also represents the mortgage companies used to remove all equity from estates. Attorney John Foley was assigned special notice as conservatee’s attorney, and Michael S. Miller was used to transfer all assets to Tran, with the Public Guardian’s approval. Coincidentally, M.S. Miller lost his license to elder fraud, (assoc of Grilli’s former partner?? through Miller & Grilli???)! This proves lack of judicial oversight and possible RICO actions. Grand jury reports revealed over 70 million in unaccounted public guardian assets!!! They also investigated the coroner’s office which had 3 coroner’s quit due to corruption the year my dad was found dead in Tran’s relative’s house where they left him for 3 weeks while they finished stealing everything he ever worked for. They are organized crime! Tran has hundreds of similar transactions throughout every county in CA through Fidelity etal! William Foley is the Chairman of Fidelity (rel of John Foley? ), Michael Miller has a PAC, LLC. I believe its a corrupt political funding machine!!! Manoukian was the last judge to preside in the case prior to my father’s suspicious death!!! Tran was arrested in Santa Clara and taken back to O.C. for hiring a hitman around the same time! see news report! They are organized, experienced, and believe they are above the law, because they have infiltrated and abused it for their own financial gain!!! They are all taking a piece of the pie. They have their corrupt people in place! 2 doors were kicked in and I got a call from a man names John Zimmerman (Pres. of Robinson and Woods!) after filing my complaint! My Dad’s final request for expert opinion of his case evidence will be fulfilled!!! In 2012, district attorney homicide prosecutor James Leonard swept the Robert Moss manslaughter case under the carpet,. then in 2014, he framed Cary Andrew Crittenden for exposing it. Fraudulent motion to disqualify district attorney (case c1493022) filed by deputy public defender Amanda Parks ( docket no. c1493022 ) concealed nature of James Leonard’s involvement & portray Leonard as “victim”, when he’s actually the perpetrator. Note: As of date of this publication, Amanda parks is now employed with Santa Clara County’s Alternate defender’s office. Revising the Senate’s code of conduct to protect whistleblowers. Banning receipt of campaign funds during the final month of the legislative session. Banning lawmakers from receiving recreational-type gifts. Making legislative documents more accessible to open records requests (transparency). Prohibiting lobbyists from holding fundraisers at their homes. Empowering the California Fair Political Practices Commission(FPPC) to regulate politicians’ practices before as well as after elections to decrease campaign violations. Establishing an independent commission to provide oversight of the Senate. Instituting a ban on receiving campaign contributions during the final 100 days of the legislative session. Modernizing the outdated Cal-Access political finance and lobbying database so that it is less cumbersome. Two overarching informational problems need to be addressed in response to California’s corruption: 1) Individuals frequently fail to report corruption and 2) government data is relatively inaccessible. Recent reforms in whistleblower protection laws have created more protection for individuals reporting corruption. Already protected from job loss and employer retaliation, whistleblowers are now shielded whether reporting internally or externally. Furthermore, no one acting on behalf of their employers can retaliate against whistleblowers. Corruption in California can occur at every level of government. Public officials have squandered taxpayer dollars through embezzlement, police officers have abused their positions to obstruct justice, and too often, information imbalances permit these types of abuses to continue unnoticed and unchecked for years. Compared to other states, California’s state ethics enforcement and judicial accountability is limited. These statewide inadequacies leave citizens financially and legally vulnerable with regard to public corruption. To detect and deter public corruption the state and its localities can ensure protections for potential whistleblowers and improve access to government information. Citizens can advocate for both of these changes. Being confident that one will not experience retaliation for reporting crimes by public officials would reduce the fear that incentivizes many to withhold crucial information. Releasing more government information does not detect corruption, but it provides the necessary first steps for external watchdogs and auditors to do so. Systems that leave themselves vulnerable to corruption leave themselves vulnerable to ineffectiveness and distrust among citizens. California’s communities simply cannot afford that vulnerability. End California’s Judicial Corruption Now; Stop 2015-16 Illegal Budget Payments to Judges! The Public Integrity Unit supervises the investigation of cases involving corruption of public officials and employees in their official capacities or in the performance of their duties and initiates criminal charges when appropriate, generally by grand jury indictment. Crimes include theft, embezzlement or misappropriation of public funds; and removal, alteration, destruction or falsification of public records. The unit also enforces the provisions of the Political Reform Act, relating to campaign filings and practices, and the Elections Code. The unit reviews issues relating to the open public meeting law (Brown Act).